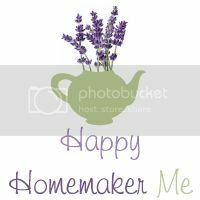 Today is the last day of our Heart of the Homemaker Series. I hope you have been blessed this week by the five women who have shared their beautiful hearts with us! Our last guest blogger is Christi, of Soli Deo Gloria. I'm pretty sure she's in line for the Super Mom award! When I wrote her to ask her if she would be willing to write for my series, she emailed back and said that she would be happy to. Little did I know that I was asking her the day before her due date! 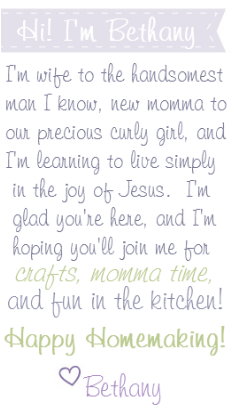 Nevertheless, Christi, Super Mom, sent me her post three days later and apologized for not adding pictures. "My water just broke, so I'm not sure what this night holds." All we do as mommies are little things: cook meals, clean rooms, do loads of laundry, read short books, comb hair, kiss owies, apply Band-Aids, push swings, change diapers, fill sippy cups, play games, praise accomplishments, vacuum….this is our domain, this is our joy….or is it…. Coming into motherhood in my mid-thirties, I struggle each day with my role as Woman. Who am I? My time is not my own anymore. I don’t have the luxury of a consistent, reliable schedule. I don’t even have the luxury of being consistent and reliable. It’s always humbling to cancel after saying yes or just saying no. My body isn’t my own anymore. I am milk machine, I am nurturer; I am using my arms and legs and hands and head for making sure my family is fed, clean, taught, and safe. My body doesn’t even look and function like what it used to. (So much for working out consistently.) My career is almost non-existent. Where does this part fit in between cooking, laundry, and quantity time? I suppose I am all these things—wife, mommy, career woman, and yet, none of them fully. I am still creative and gifted and intelligent, using these abilities in small ways each day. But where are the big dreams and goals I had planned to accomplish? How am I using my educational degrees I earned in school? Where are the accolades and the recognition? Perhaps I have let the world define me for too long. I have believed the world and the Bible simultaneously. Yes, God gives us our dreams, talents, circumstances, experiences and even goals. “The mind of man plans his way, but the LORD directs his steps,” Prov. 16:9. Yet, the way never looks like what it does in our minds. After all, “who can make straight [the path] God has made crooked,” Eccl. 7:13? But I look at what I used to be and what I feel I’m missing out on now and have reached Discontentment. What I need to accept is that those gifts, talents, callings, and passions are applied differently at different seasons of our lives. And as His beloved daughters, we have a different path than the world. We are NOT our own. We do not own our lives. The world wants us to believe that we can do and have “it” all. And what’s more, we deserve “it.” But the truth is we are bought by and dearly loved by the Lover and Creator of our souls, who governs all our circumstances, invents all our steps, guides all our talents and gifts. What joy to know we are owned and taken care of by the One who has woven each cell of our body together for His joy and glory! How does this look on a daily basis? The Psalmist says in Psalm 131:1-2, “O LORD, my heart is not proud, nor my eyes haughty; nor do I involve myself in great matters, or in things too difficult for me. Surely I have composed and quieted my soul; like a weaned child rests against his mother, my soul is like a weaned child within me.” As a dearly loved daughter, with my Lover working out all the details of my life, orchestrating all my circumstances and giving me all I need for the step I’m on, I can choose to remain content. A weaned child, who is not distracted by the breast, rooting around seeking contentment, I rest peacefully against my Lover’s breast. I sit contented, fed, nourished, not wanting for anything, because, just as the child knows, I, too, am fully provided for, resting in that which has been given to me as all I need. The Psalmist also makes the determination not to involve himself in those lofty ideas and questions that belong to God and His sovereign plan. He has determined to not be so prideful as to write his own answers or go his own path in response to those desires and passions that vex him. Ultimately, to not determine his own path, but to submit to God’s sovereign will. He “composes and quiets himself,” sitting contently, not being squirmy, by choice, in his mother’s arms. He trusts all is well. With the big questions left to be answered and worked out by the One sovereignly organizing the universe, I can joy in the Little Things, and the Little People entrusted to me. After all, isn’t that what God requires of me, to be “faithful in the small things?” As Jesus said, Matthew 25:21, “Well done, good and faithful servant: you have been faithful over a little; I will set you over much. Enter into the joy of your master.” Isn’t His joy our joy? So….who am I? I am the beloved of my Lover, child of my Creator; I am the keeper of my home—watcher of what comes in and goes out; I am the lover of my husband and children, I am a talented, gifted woman, using my gifts as God provides the circumstances and in unexpected ways each day as the path unfolds. I am a contented child, resting quietly against my Father’s breast, God helping me. 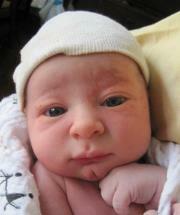 Congratulations for Christi and Rob on the birth of their beautiful son!